More video from the Destinysong studio courtesy of my iPhone 3Gs. Watch it over and over and over again! You must! Julian and I hit a milestone in that we are now complete with all the electric guitars on the forthcoming album. We explored a lot of different sounds and textures. The most successful arrangement for us is seen in this video. We ran several sounds on this CD for electric including some mono stuff, and the ol’ mic the amp mic the room technique. But we were most satisfied with true stereo. With Marshall and Fender amps; Fender, Gibson, and Gretsch guitars to choose from, our sonic palette was quite diverse. Enjoy more video taken from my iPhone including a little 4th of July bonus. This week we have been experimenting in the studio. 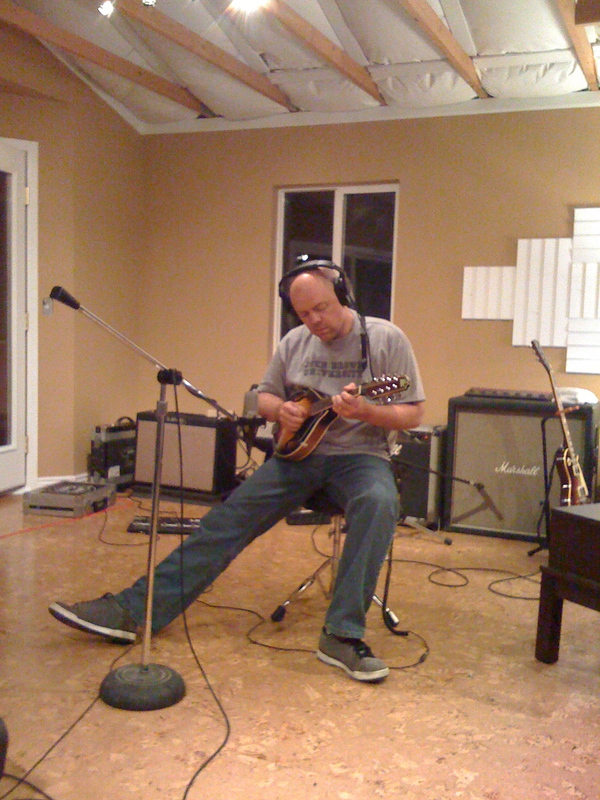 And in the words of Bruce Dickenson, yes the Bruce Dickenson “exploring the studio space.” In the course of things I found myself with a mandolin in my hands cutting some tracks for a tune of Julian’s. This one’s for you Ted. A year ago today I was rejoicing in a successful evening of Easter services (and preparing for more on Sunday!). I rejoiced in the opportunity for believers to celebrate our Savior’s resurrection and those who made first time decisions for Christ. It was by far my favorite Easter program I ever had the fortune of participating in, let alone to lead. (For video of that service, check out the videos section of this blog.) It was a weekend of rejoicing for all God had done, and continued to do in many ways in our lives. This weekend we have a different kind of milestone to celebrate. God is so good. A few months ago, a very Holy Spirit inspired couple asked a simple question to Dina and I, “when will [we] build the studio?” Little did we know they were planning to mobilize this effort. See, it has been a dream of mine to have a professional recording studio located right in our own home for many years. We have built 3 home studios (2 in basements and 1 in a bedroom) and have produced several projects out of these studios (and actually ended up with a few good ones). But I always wanted to take it to the next level. The first time Dina and I drove onto our property here in the Black Forest we saw a detached and oversized garage and the first words out of our mouths were “that’s where the studio will go.” Well here we are some years later and the dream has come true. In the most unlikely of times and under the most unlikely of circumstances, inspired by our amazing friends who have sacrificed in a huge financial way, propelled by big vision from the Lord for change in the world, and seen to fulfillment by a small group of believers who still believe in miracles, Destinysong is now a reality. Today, Dina, Julian, Jasmine and I put the finishing touches on the studio and officially moved in our first bits of gear. I stood in amazement that God would bless us in this way. And the elation I felt one year ago in the fullness of how great an Easter Celebration could be, is only eclipsed by my utter astonishment at how the faithfulness of a few can birth a vision into a reality. I have been posting pictures on the Destinysong website for the past 3 months to show the progress of the building project, and as soon as the weather clears, I’ll snap a few more of the beautiful, final product. Check out our website here (or click on the link in the sidebar) and I pray that all of you are blessed as you celebrate the resurrection of Jesus tomorrow!